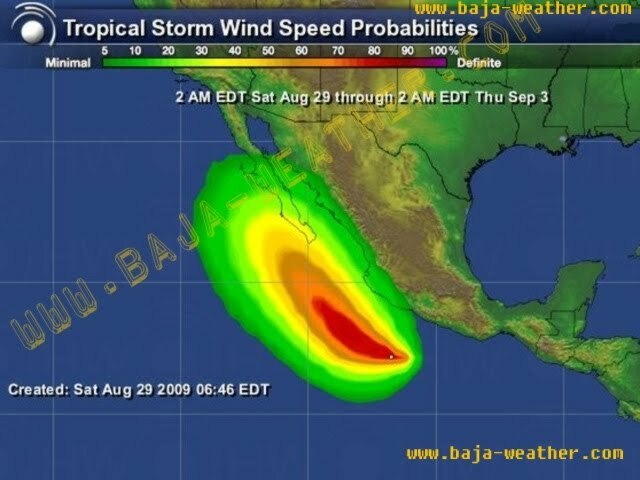 As the tenth tropical storm of the 2009 east Pacific season forms south of Mexico! 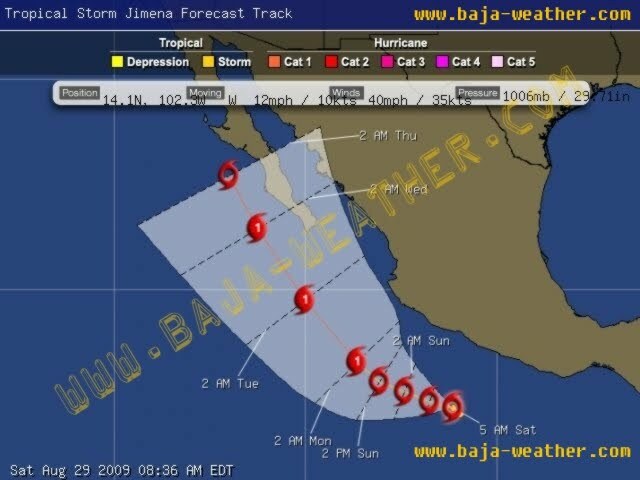 The newly-formed Tropical Storm Jimena was located near latitude 14.1 north, longitude 102.3 west southwest of Acapulco. Jimena is moving toward the west near 12 mph...19 km/hr. A gradual turn toward the west-northwest is expected during the next 24 to 48 hours with some decrease in forward speed. Maximum sustained winds have increased to near 40 mph - 65km/hr with higher gusts. Strengthening is forecast and Jimena could become a hurricane in the next day or two. Tropical storm force winds extend outward up to 35 miles - 55 km from the center.For instant notification on weather systems note out Baja Weather twitter URL in your bookmarks - http://twitter.com/baja_weather - or send us an e-mail if you at the Baja with your cell phone number and we add you to our text-message notification system. This is a free service sponsored by the Baja Racing Club, a new interactive Baja racing website opening at the baja 1000 it's virtual doors.